STOP SEEDING BLIND KNOW WERE YOUR IMPUT COST ARE GOING. 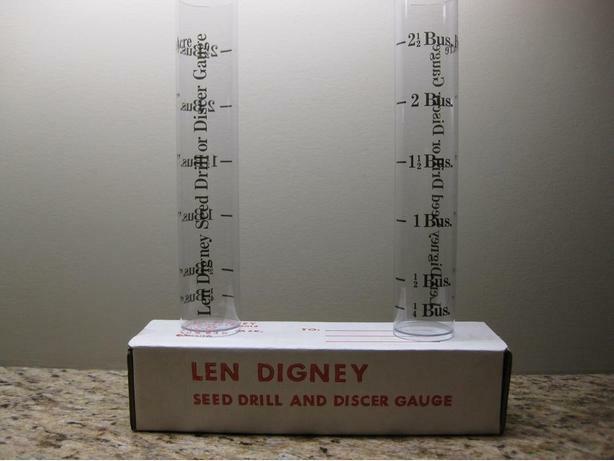 LEN DIGNEY Seed Drill and Discer Gauge. Works Great...with any SEED DRILL, DISCER, TILLER or AIR SEEDER to set the required number of Bushels per acre right in the yard with two or three handfuls of seed. Easy to use for measuring the correct number of bushels per acre when seeding Wheat, Oats, Barley, Flax, Canola Etc. Easy and simple to use comes with complete instructions. Back by popular demand..Satisfaction or Money back guarantee. Limited supply. Now shipping across Canada, USA and Australia. Only $45.00 or purchase two for $75.00...plus shipping. Place your order by email or call the order desk @780-983-5582. Accepting Visa or Master Card. Makes a great gifts that is useful and the seed gauge will pay for itself after the first use, no more guessing.